My first D&D essay for Loren’s blog ranked D&D elements from essential to arbitrary. I described how the D&D rules exist merely to get the Dungeon Master and the players working together to build a story. The rules formalize some activities that characters will engage in, and together with the dice, they facilitate the impression – one might say illusion – that the story world has objective laws. In short, the rules are indirection, a magician’s handwaving. You cannot be naively bound by them and expect to play a good game of Dungeons & Dragons. They exist to facilitate a story, not to dominate your attention. My goal with this essay is to help you understand how that works. To play D&D, you should acquaint yourself at least with the tier 1 trappings as I described them in the last essay. At a minimum, you need to know about the five Platonic solid dice; the four basic character classes; the four basic races; the alignments involving good, evil, law, chaos, and neutrality; the six attributes of strength, intelligence, constitution, wisdom, dexterity, and charisma. You should understand skill checks, armor class, and saving throws. You should learn the main cleric and magic-user spells and popular magic items. You should figure out how you’ll grant experience points and what scale you’ll use to determine when characters level up and thereby gain more hit points and new skills and spells. You should know about gold pieces, and to a lesser extent copper, silver, electrum, and platinum (well, maybe not electrum), along with gemstones of various kinds. You should know what standard weapons and armor are available and acquaint yourself with the most popular monsters in the game (at the least: humanoids and giants, dragons, undead, demons, lycanthropes, a few squidgy things, and a variety of gigantic reptiles and arthropods). Next, memorize the adventure you’re going to run. 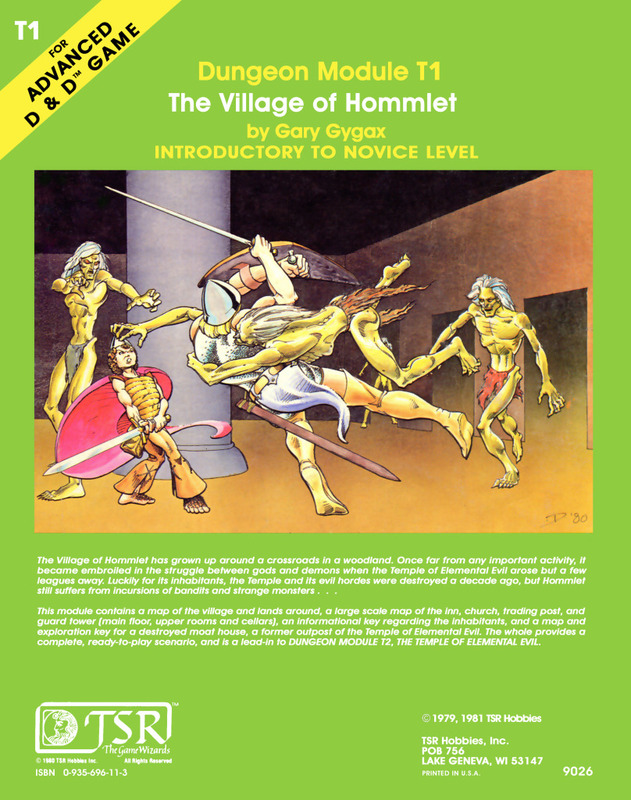 Buy The Village of Hommlet or one of the other low-level adventures in Loren’s post 40 Classic D&D Modules Ranked; get an idea of what makes it work and then use it or write your own. (Don’t worry that the adventure you buy has old rules; translating rules and stats should be trivial, and where it’s not trivial, dump the rules and stats.) Know the geography, know all the important buildings and their rooms, know all the major monsters and their treasures. Know what the probable endgame is, provided the characters survive. Will the characters ultimately slay a dragon? Retrieve a powerful magic artifact? Bring down an evil leader? Gain a clue to a greater adventure? Evaluate the story possibilities of each intelligent monster and “non-player character” (that is, the people in the adventure whose roles you’ll act out). What does each monster and non-player character, or NPC, want? Which ones are allied with each other, and which are enemies of each other? How do the adventurers threaten the monsters’ goals? How might they advance the monsters’ goals? Write down the names of the intelligent monsters and NPCs, putting them into allied groups, and draw lines to enemies, thicker lines for serious personal enemies. Beside each one, write what they want more than anything in the world, and their most loved companion and/or possession. Take a few notes about how the characters might fit into their plans. List non-intelligent monsters and what relationship, if any, they have to intelligent monsters. How might intelligent monsters use them to help or hinder the party? Finally, write out a list of names for good and evil characters and monsters, so that when you invent characters on the spot – and you should now and then — you can pick a name that has the right tone. If you have a name handy, your players will assume you’ve got an interesting background all prepared to back it up. That may sound like pressure, but with practice, it’s not hard make up a background as it becomes relevant. If you don’t trust yourself, sketch out some backgrounds to go with your name list. From a first glance at the D&D rules, you’d gather that the procedures are complex. They’re not. As Dungeon Master, you describe a scene, answer questions that arise, and act out the roles of NPCs. When the characters have fulfilled some scene objective, like having met a character and gotten information, slain a monster, or passed a locked door or dealt with a trap, you give a general narrative summary to move them to the next interesting situation. If there’s a question of an action succeeding, you do a skill-check roll, whose result you may only pretend to consider. When there’s a fight, you resolve blows in a round-robin, according to initiative order (look it up), rolling dice for monster attacks and letting the players roll dice for their characters’ attacks. That’s pretty much it, but it’s a deep skill to see it goes well. First, you tell your players the large story of the world, who the famous political figures and monsters are, and what condition the world is in. This should comprise only a few sentences. Next, you tell your players what the immediate situation is and immerse them in a scene. When they’re first starting out, you give them strong direction, but don’t explicitly hand them their motivation and goals. See “The Setup Problem,” below. Narrate details to get the players asking questions. If they are asking questions, they are exercising their point of view, trying to visualize your world. See “The Point of View Problem,” below. It’s great if you do some acting now and then and address the players in the role of an NPC or monster, but you don’t need to push it. Simply stating what a character or monster says or does in third person will suffice most of the time. Note that you set up a scene and narrate in real-time mode for mystery and conflict. Don’t linger in a real-time scene unless it has larger plot implications. Meeting various shopkeepers in town, for instance, to get the best trade price for gems should be summarized unless you want to acquaint the characters with a significant NPC. If the players insist on a real-time chat with a shopkeeper who has nothing to do with the plot, then make him have something to do with the plot. You might have to rewrite your script and move a character from point A to point B and change his name and profession. So be it. Always reward your players for taking initiative. When there is a combat, all you really need to consider are surprise, initiative, ranged attacks, and melee attacks. Never dither in interpreting rolls, especially combat rolls. It’s enough to have a general sense of the armor classes the various characters have and the circumstances that might make fighting easier or harder. An average character with no armor is going to be hit on a 10 or better before modifiers. A heavily armored fighter might be hit on an 18 or better. Most monsters have bonuses, so a roll of 18 is going to be a hit most of the time. As Dungeon Master, don’t worry about getting it wrong: you’re never wrong, but you may have to stretch for a reason why you’re right, especially if your players know the rules well. Learn the intricacies of combat only to supply convincing answers to questions. Don’t slow down your combat to make allowance for the rules. Keep the combat moving, and start giving everyone cumulative bonuses if it threatens to drag on. You are performing for an audience of players. It’s great to get input from the audience, and to work with the audience, but really you’re there to lead and entertain them. You definitely are not working against them. Here are some general tips for performing with confidence. High rolls always succeed in some way, unless success is proscribed ahead of time for a good reason, for example, if a key does not fit a lock because it’s important to the story they find the right key. Get players in tough situations, and then exert your imagination to help get them out. Make sure you have plausible levers to pull. For instance, have them run across strong NPCs who can come in and help. Lie shamelessly. The DM is right even when wrong. If the players catch you breaking the rules, cover it up with an excuse. Never concede a mistake; never be indecisive. You do not make mistakes. However, learn enough of the rules so that you’re confident you can break them without being called out. You don’t make mistakes. But let’s pretend you could. Don’t make the following ones! Getting the characters involved in a combat that has no relation to any larger story. Having combats last more than a few minutes, unless they’re showdowns elaborately staged with miniature figures. Long combats are for encounters with archenemies, with monsters the players know on a first-name basis. Spending more than a second looking up what any die roll means. It’s so tempting to do. Don’t do it! Pronounce your judgment. Bone up on the rules after the game and apply them next time if you want. Letting the characters roleplay with characters or monsters that have no relation to the larger story or who cannot lead them to an effective place. Asking players what their characters want to do rather than giving them an effective setup that gets them asking the questions. Letting the dice tell a bad story. 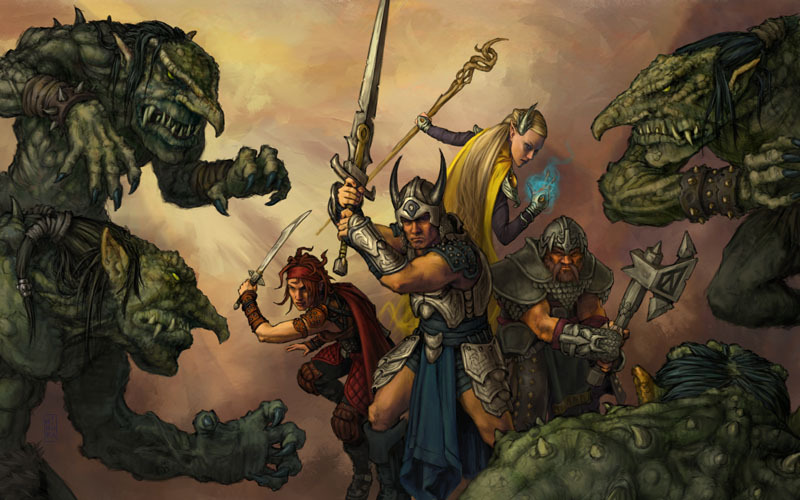 D&D has serious problems as a storytelling art form that are unacknowledged in the rules. Here’s what they are and how to address them. Why is there a dungeon stuffed with monsters and treasures nearby? Why haven’t powerful characters and disciplined soldiers already cleaned out the dungeon? Or why haven’t they crushed the assassins guild in the city or routed the wererats in its sewers? There’s a major pitched conflict between the forces of civilization and those of chaotic evil, where all the proven heroes are called away to fight, leaving local ruins vulnerable to unchecked incursions of low-level monsters. The campaign happens in the aftermath of a major battle that has annihilated most local heroes and boss monsters alike. The few survivors are regrouping in secret. Higher-level characters inevitably get enmeshed in adventures that take them to the Outer Planes, leaving the prime-material world largely undefended. High-level heroes and their antagonists are hiding in plain sight, concealing their powers for fear of attracting attention to themselves. There’s a sort of stalemate to which the player characters are mostly, but not totally, oblivious. The party can do their thing only because neither captains of good nor lords of evil really consider them a threat, though both sides will be watching as the characters mature. All these scenarios accomplish two things: they give the starting characters ideas about the kind of heroes they can become and the interesting trouble they can aspire to, and they establish the campaign backdrop. 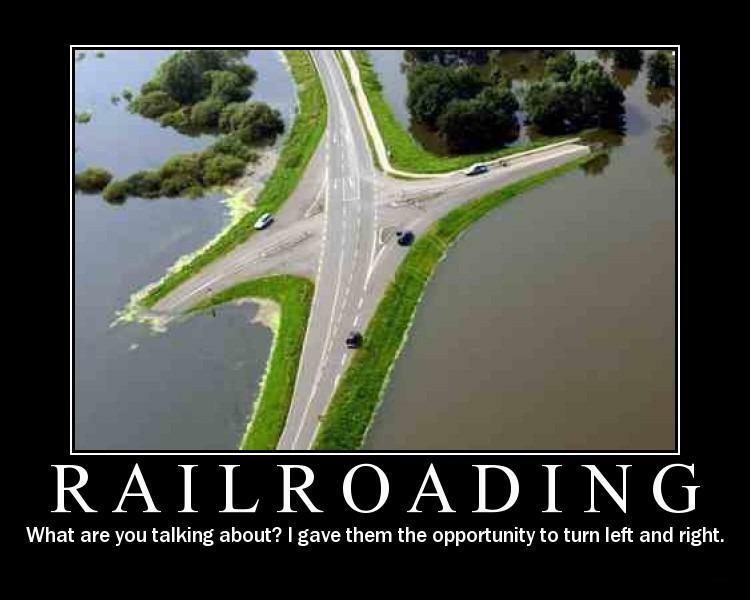 “Thou shalt not railroad your players.” This is an important commandment. The characters must be free to go where and do what they want. The setting should not be so brittle that there is only one path, especially if that path can be blocked. But when you’re first launching a campaign, your players need direction. The players should not be compelled to follow a certain course of action, but the setup should be strong. If they exit the setup, hit them with another similarly strong setup from another direction. A good setup should put the characters in an angsty situation. People will suffer if the party doesn’t take action. Or, something mysterious is going on, and they’re torn by curiosity. Simply saying there’s adventure and treasure waiting in that cave yonder will serve for most players, but it’s a weak start, and you’ll have to overcome low expectations by being especially clever later on. In fiction writing, you tell a story through the viewpoint of one or more characters. The things that the characters notice reflect their mental state, their habits, and their preoccupations. The things they notice reinforce their character. How’s that work in D&D? 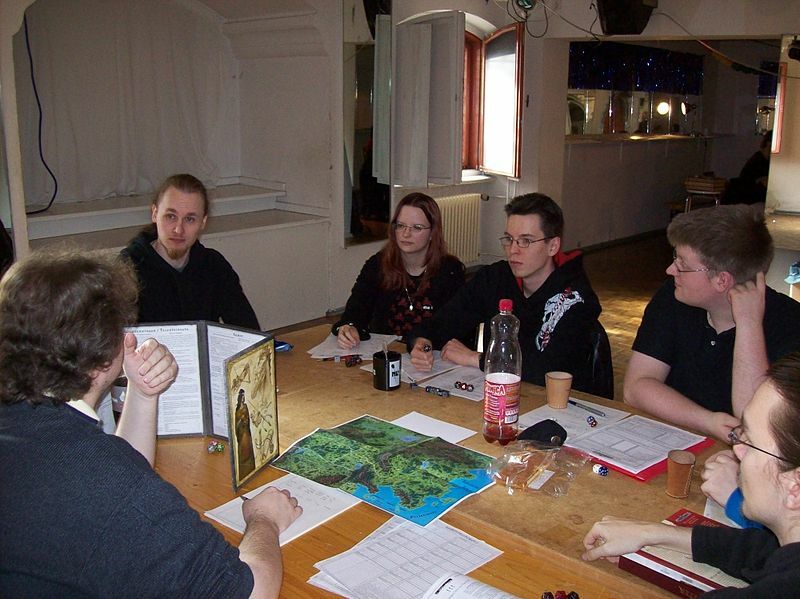 The Dungeon Master describes the scene, so the players borrow their own characters’ viewpoint from the Dungeon Master. This problem is not completely solvable, but it can be mitigated a lot. Most of your narration should be prompted by what the players are interested in and ask questions about. In this way, you’re collaborating on the characters’ point of view. You know your game is working when the players are frantically asking questions, declaring actions, or hanging on your every word for information. You know your game is not working if you have to keep asking your players questions. Give them captivating details to ponder. Also, make sure your players understand their options and prod them about their skills and spells until they have some they regularly use, like spells to detect magic, know alignment, or see hidden objects, and the ability to hide, listen, or move silently. They should never be out of options. And if they try something, it should rarely just fail; it should give them a thread to follow to the next interesting situation. If the players are not asking questions or otherwise taking initiative despite your best efforts to draw them out, you can get one of them to roll a twenty-sided die for a Perception check to notice something. You can let them apply their wisdom bonus or penalty. Ideally, you seldom do this. When you do, make it at least intermittently rewarding. Not only will it grab their attention from then on, it reminds them to ask questions. A Perception die roll that indicates success shouldn’t really be more significant than failure. Both represent an opportunity for you to advance the story. For example, maybe the characters are at an inn and a cultist assassin is among them. You may decide a high perception roll indicates that a character spots a wicked curved dagger at the assassin’s belt, and something (poison) drips from the scabbard onto the floor. With a low roll, the character may glimpse something mysterious on the man’s belt when the man arranges his cloak but the character isn’t quick enough to see what it is; however, the character will notice a spot of liquid on the floor. Either way, there’s a mystery that amounts to the same level of direction. Unless the player is especially dimwitted, they will almost certainly ask questions about the mysterious liquid. But what if the player really is dimwitted? Well, your challenge then is to make the character look smart. Maybe a fawning non-player character helps the player make connections. A knight’s squire may opine, “If only we had some way of sneaking up silently on the hobgoblins,” to remind the character of his elven boots of stealth. It’s great to have smart players, but it’s also rewarding to overcome their limitations. What is combat good for? I think it was Ursula Le Guin who once wrote that the more action there is in a story, the less is going on. This can be especially true of combat in D&D, where the “action” is abstracted down to dice rolls and some narrative. Far too may Dungeon Masters in my experience run their adventures as a slog from one session of dice-rolling combat to the next. Several hours of play can be summarized as “The party killed a bunch of orcs and an ogre in a ravine. Then the party killed some trolls in a cave. Then the party killed another bunch of orcs.” And so on, without much progress in realizing a story. Monsters have stats for taking damage and dealing damage, and combat’s an obvious way to interact with them. The D&D rules comprise a lot of material on armor, weaponry, fighting, and damage-dealing spells, so it’s easy to get the idea that the game is all about combat. Combat is formalized and game-like in a way that’s easy to understand, and it’s a clear fallback when no one at the table knows what else to do. Characters and monsters run into each other, then you might roll for surprise, you definitely roll for initiative, and you take turns rolling to hit, and when someone hits, they roll damage. Repeat. The problem with combat, other than its being a crutch for the baffled, is twofold. On the one hand, if players routinely prevail, the combat becomes a rote distraction that doesn’t really complicate the situation in interesting ways. On the other, characters may get killed. A combat that isn’t clearly pointless can still be unpredictable and mess up the direction of the game. You need to manage combats so that they build on each other to complicate and enrich your larger story. The basic function of combat is to help players gauge how generally powerful their characters are. The academic term used by game mavens Richard Garfield, Skaff Elias, and Robert Gutschera in their excellent book Characteristics of Games is “positional heuristic,” or rule of thumb for knowing how you’re doing in a game. Combat is a positional heuristic. If it involves a little concrete math, it helps the game feel objective and sets player expectations. As players defeat and are routed by a few different kinds of monsters, they get a sense of how they’re doing, and when their characters advance in level, they can appreciate the advantages they’ve gained. As characters approach the heart of an adventure, say deep into the dungeon, or near the inner court of an evil king, the combats become incrementally harder, which can increase tension. When combat goes against the party, the setback should hold the seed of an interesting development. Way back in junior high, I ran an adventure for my cousin where he infiltrated the home of evil merchants in a town. They got the drop on him, and knocked him unconscious. He had already pretended to be their friend and revealed that he knew about their plans, so it seemed logical that they would interrogate him. What’s more, he had been talking to powerful good citizens and told them that he would investigate the merchants and report back. So not only was he kept alive for interrogation, but help was on the way. The interrogation even became a de facto reverse interrogation, as the merchants let slip crucial information while asking their questions. This seemed logical, but it was far from self-evident. You have to be creative. Always. Keep in mind that combat may not be the only option for resolving an encounter, and may be the poorest one. Most creatures, intelligent or not, don’t want to risk their lives in a fight. Always think about their motivations. Monsters can try distraction, bargaining, and intimidation. They might try to dupe the party. Maybe they lure a party into a fight with other monsters that they want eliminated. Maybe the party does this to the monster. Rather than a liability, one’s opponent can be an asset if manipulated or recruited. The rules get in the way of playing every bit as much as they make playing possible. D&D is not about following rules. Even so, it’s good to agree on a sizeable body of rules and encourage everyone to learn them. The rules applied to the dice in conjunction with the mistakes the DM inevitably makes prompt the DM to improvise and constantly scavenge for new storytelling opportunities. In short, covering up your rules mistakes can be a big and rewarding part of the game. Say a player rolls to hit a ghoul and you declare a miss when the player, with his encyclopedic knowledge of the Monster Manual, insists that his character should have hit. The wrong thing to do is concede a mistake. The right thing is to change the situation on the fly to make yourself right. As the DM, you must always be right. Maybe you decide that the ghoul wears a +3 ring of protection. Then you realize that when the characters defeat the ghoul, they’ll be getting a magic ring that will make them too powerful, so you decide it’s a cursed item that will turn a character into a ghoul, or an item with limited charges, or a ring only wearable by ghouls. Or maybe you decide that a +3 ring of protection is better than the treasure you originally assigned to the ghoul and let it stand. In any case, you want to apply the rules so as to avoid many of these improvisations, but every mistake should be viewed as an opportunity to enrich the story. If no one is overly meticulous about given rule details, especially in combat, then you’re very silly if you track them. Combats should be fast, but often they’re very very slow, because players try to incorporate all the possible situational modifiers. Why? In the interest of “realism”? The DM should imaginatively describe the combat scene and then roll and look at dice just long enough to create a little tension, longer when the players are really on the hook, so that their imaginations have a little time to work. It’s more important that the DM master drama than the rules. Players will generally not consider how fair the DM is to their opponents. But some may try to avail themselves of every obscure rule, bogging down the narrative. The DM needs to be familiar with the rules just enough to refute these players’ stratagems. Probably the easiest thing to do is to keep the narrative moving, giving the player scarcely more time to declare attack options and bonuses than is needed to swing a weapon (or roll a die). A D&D adventure that really modeled reality would never get around to rolling dice. It would be run by a Dungeon Master who had godlike knowledge of an impractical number of variables. He would know whether the arrow hit the target because he would know the distance, wind speed, amount of coordination and muscle memory the shooter has, plus gazillions of other factors, reaching to the limits of time and space. If he rolled dice at all, they would not be “to-hit dice”; they would be judging events in the quantum foam, on a scale that makes a single atom the size of a galaxy. 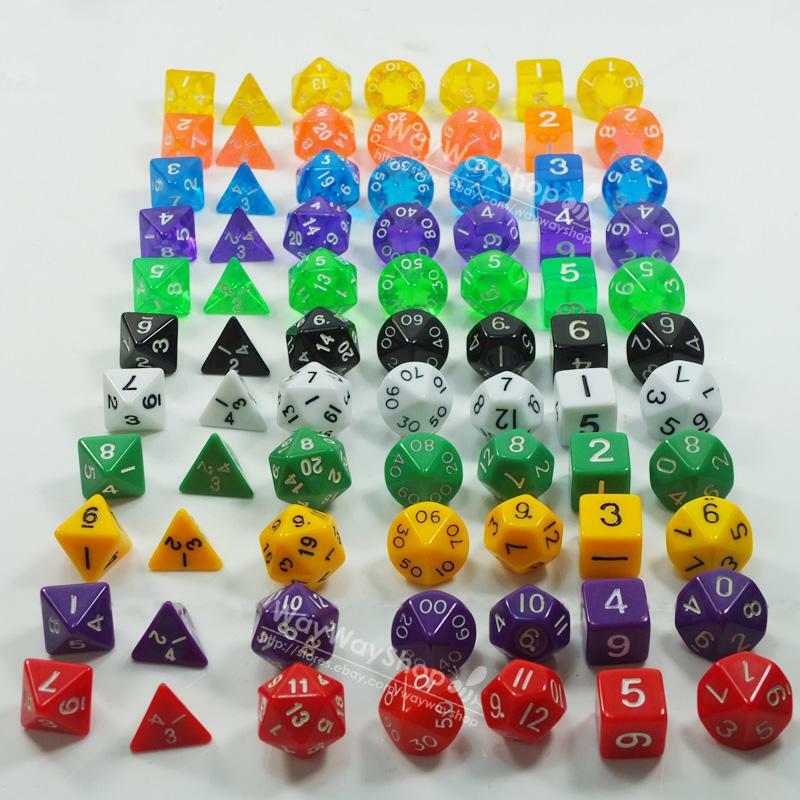 Dice are generally too crude to model reality. But D&D dice are an exception! They are magic dice. They channel a world where your characters really exist. The dice tell the story of what actually happens. What’s more, this is always a fascinating story that will captivate, move, and inspire your players. For example, the dice never kill the characters. If the players are making an effort to use their brains, the characters will win through. Only willful stupidity, either yours or the players’, will get the characters killed. If the dice are telling you that the characters are unfairly thwarted or killed, or even if they’re telling a boring story, you’ve made a mistake. You’re using the dice to judge the wrong thing. Instead of re-rolling the dice, use your power as Dungeon Master to change what you’re measuring the dice against. Is the axe-wielding ogre likely to smash the character flat? If the next die roll can ruin the story, then you’re missing something. The dice only tell good stories. You roll a hit. You roll lethal damage — closed-casket lethal. There’s no way out of this, right? Or maybe you’re not comfortable going off-script. Maybe you just rolled the die wrong and need to roll it over. Yeah, maybe that’s it. This is an embarrassment, of course, but no one is likely to notice just this once. And it’s not near as embarrassing as having the dice tell a bad story. Because dice don’t tell bad stories.